Take an amazing countryside trip around Jeolla—Korea’s best food region—in Travel Guide’s two-part special visit. Traditional dining tables in Korea have side dishes collectively known as banchan. These little servings come from a plenitude of fresh, fermented, or seasoned foods. A typical banchan set has a bit of kimchi, bean sprouts, and sliced cucumbers, but the kinds of specialties often vary from one dining location to another. Palatable banchan combinations are apparent in Jeolla-do, a region in southwest Korea. Many locals and tourists (myself included) give high regard to the restaurants in Jeolla for their endless banchan selections. 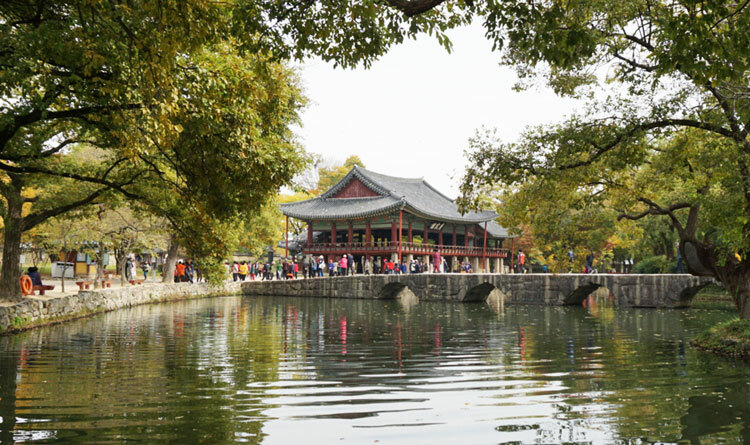 And, as gluttons rave about their unique banchan experiences, so do travellers adore the myriad of attractions in this diverse province. A journey to North Jeolla from Incheon International Airport takes approximately three hours only on a coach or private vehicle. 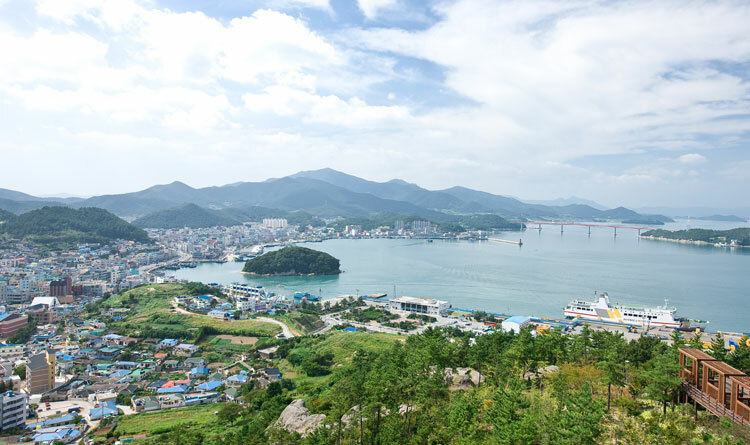 For a bit of an enjoyable ride, arriving in the coastal city of Gunsan offered greater delight in so many ways. Gyeongamdong Railway Village, one of the highlights of my tour’s first leg, emanate a charming, quaint vibe. Visitors at the village can don vintage Korean school uniforms, have photos along the olden tracks, and try amusing mini-games. The intimate neighborhood atmosphere was genuine, to say the least. Further down the city’s rich history, the Hirotsu House serves as a reminder of opulence during the Japanese occupation period. A little over an hour from Gunsan is the mountainous stretch of Sunchang county. Here, gochujang or Korean red chilli paste is the cause for celebration. 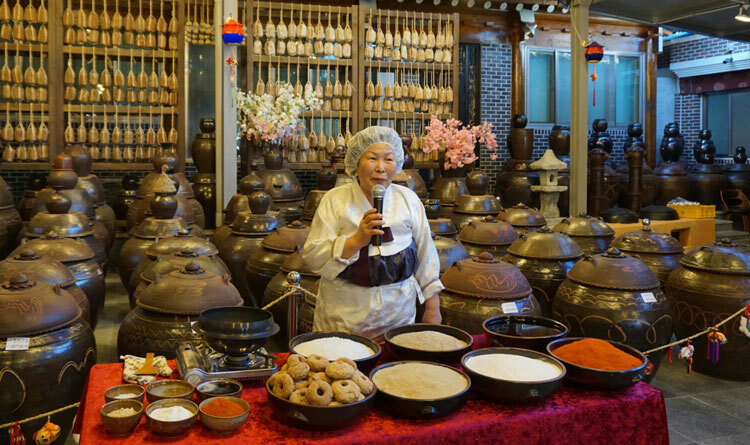 A congenial aunt or ajumma from Sunchang Gochujang Village, who is famous for making gochujang, offered a hands-on experience for chilli paste preparation. The recipe, she shared, has been passed on through generations and the traditional methods have stood the test of time. For those who want to learn more, there’s no other place to go then Sunchang Traditional Paste Museum. Before bidding my ajumma goodbye, she mentioned that food preparations are only in autumn and winter. It’s no coincidence that the colourful Sunchang Fermented Food Festival happened right at the time of my trip. Known for gochujang and other fermented foods, this festival is celebrated every autumn as part of the locals’ awareness of their health and well-being. East of Sunchang County is Nawmon City, my next destination. It afforded a gentler pace for the day. A short stroll in Gwanghalluwon Garden breathed a sense of calmness. 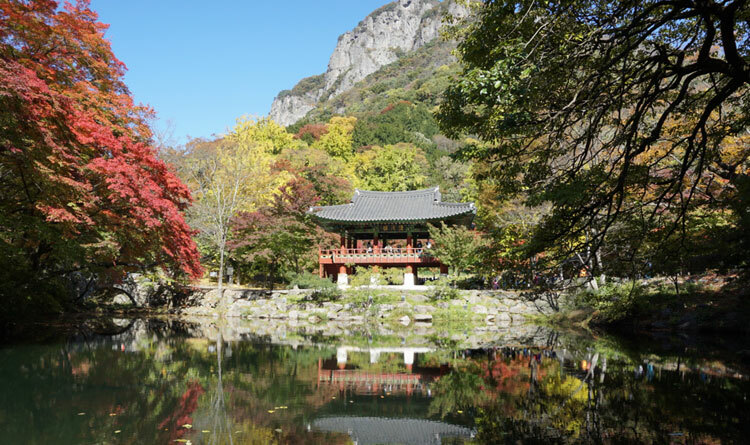 Sitting amid a quiet pond in the middle of the garden, I came to realize Korea’s natural allure is upon me. Soon enough, my appetite made its presence felt. The popular Chueo tang or loach soup has many benefits according to locals. As with all Korean dishes, it was worth a try. 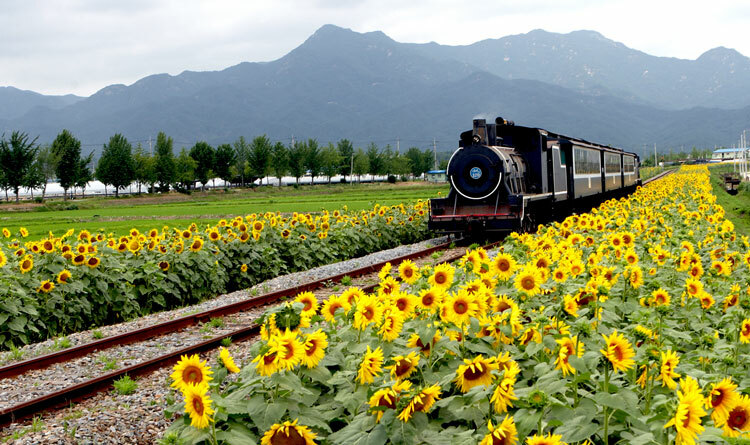 The steam engine train from Seomjingang Train Village in Gokseong County runs for 10 kilometres to Gajeong Station. In between these two locations, a scenic view of the Seonmjingang River flows parallel to the track. While on board, a snacks vendor wearing a loud attire briefly took my attention away from the landscape. Not long after, the exact replica of the archaic locomotive makes its only stop at Suncheonman Bay, a wetland reserve that offers glorious sunset in a field of swaying reeds. In the handful of attractions I’ve seen throughout Korea, Boseong Green Tea Plantation in Boseong County was one tiny tea flower short of heaven. The unending stretches of greens painted what an earthly paradise might look like. No wonder the plantation got a huge nod from CNN Travel. Back on the road, I was too late to realize that the journey has been in South Jeolla for the past couple of days. Reading through my itinerary, the Wando Tower Observatory and Wando Island Abalone Tour provided a strange pairing of scenery and culinary. From the tower’s observation room, my scepticism soon faded. More than 100 acres of the abalone farm right on the blue waters can be seen from above. When it was time to head down to the farm up, one of the farmers pleasantly approached and shared a bit of his story. The fellow actually owns some of the farm lots. Now 36 years of age, he’s been honing his craft for a decade. Needless to say, the abalone from his farm was mouth-wateringly delicious. According to the friendly guide, 56% of the Korean population work in agriculture. 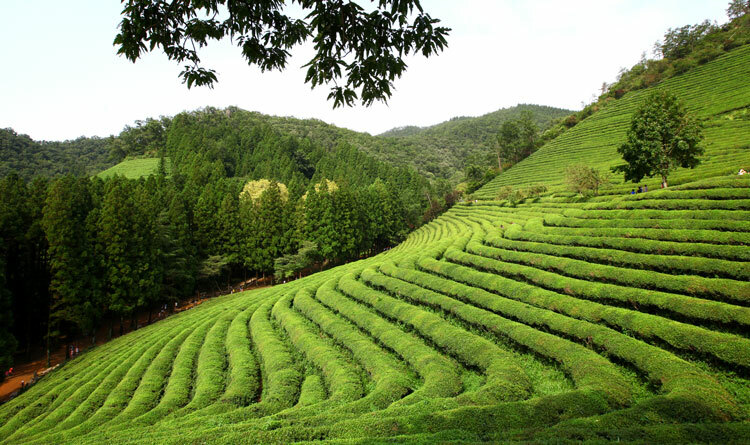 After having been to a tea plantation, abalone farm, and the Naju Pear Farm in Naju City, I found more meaning in it. 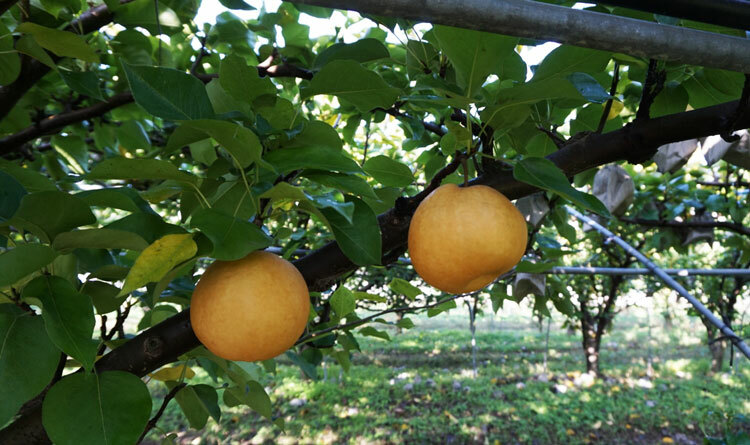 The farm has a distinct area of pear trees with overarching, intertwining branches. Naju City is also famous for persimmons, and although these were harvested prior to my arrival, the fruit detour didn’t end in vain. The pears were so plump and juicy even the farmer’s faithful canine knows it. Naejangsan Mountain, located in Jangseong County, loosely translates to “a mountain with many secrets.” For reasons I haven’t fully unlocked, I found the mountain’s beauty no secret at all. Its autumn foliage, blending faint shades of red, green, and yellow, whispered the nearing end of my trip in Jeolla. How befitting it was to feel like a swooning lead character in a classic Korean drama. 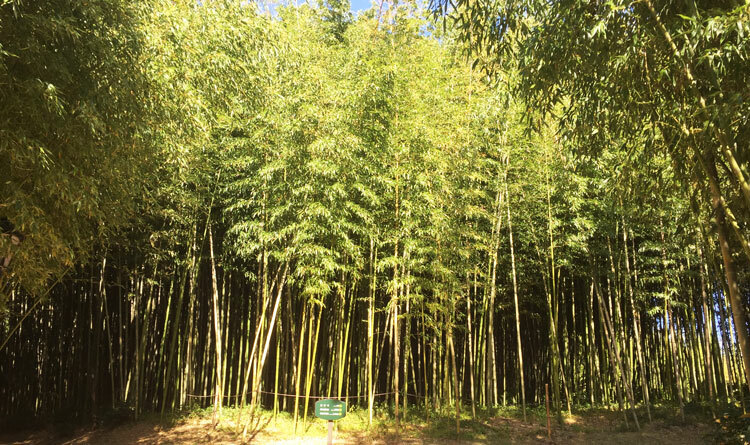 From one lush forest to another, Damyang county’s Bamboo Garden stretched its long arms in a welcoming embrace. Visitors walking along the garden’s eco-path immersed in tranquil scenery. Meanwhile, I imagined pandas chewing on their favourite snack in sheer delight. As for me, a taste of the healthy Damyang Daenamutongbap, which is rice steamed in bamboo accompanied with grilled meat patties, was a well-deserved lunch. This meal became the prelude to the Damyang Meta Provence, a themed village that took a bite of Italy’s beautiful culture. On the return trip to Seoul, an appetizing image of Jeolla was carved in my stomach, but more so in my head. For five days, I discovered a region that revels in its potpourri of attractions, similar to how Koreans crave their banchan. Yes, Jeolla is a prime destination for autumn, and capturing its beauty in summer, spring, and winter are stories still need to be told. 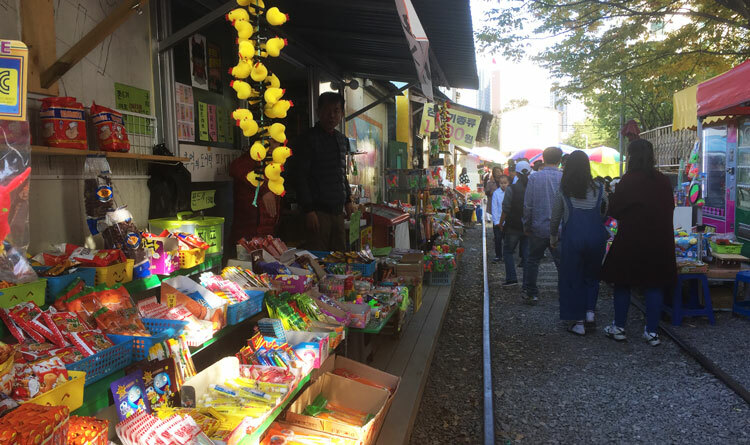 Follow the second part of Travel Guide’s special on Jeolla, Korea where we take huge bites of the local specialties! Be sure to follow the next part of the article. The Travel Guide team would like to thank Korea Tourism Organization, Jeollabukdo Province and Jeollanamdo Province for making this trip possible!